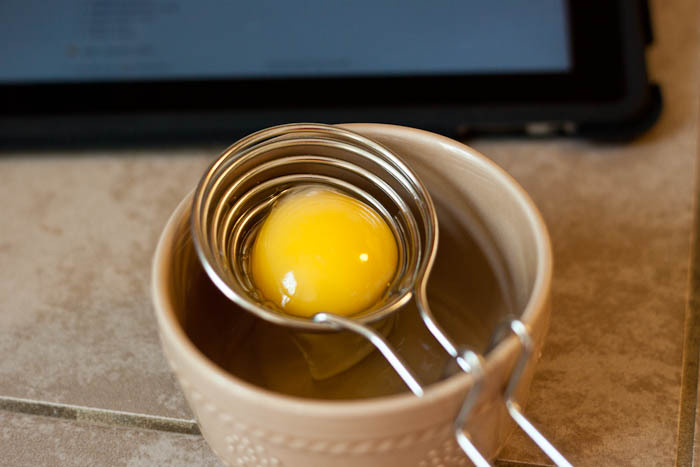 There are a couple of ways you can get egg whites. Fresh eggs I buy at Costco for $7 and some change for 5 dozen, which is usually what we (well …me!) go through in 1 week. How do you get the yolk from the white without a huge mess or the yolk breaking? This sweet little thing my mom got me a couple of years ago. What to do with the yolks? Well, yolks have 5 grams of fat, all of an egg’s vitamin A, D, and E; almost all the vitamin B12, choline, folic acid and vitamin B3. Good for the developing brain. So I keep them and my kids pretty much have strictly scrabbled yolks and I usually do a 4 whites to 1 whole egg ratio for scrambles. Babies can have yolks starting at 8 months old but they cannot have the whites until 1 year old. Egg whites are one of the top 8 children allergens. So I have perfect live egg yolk disposals 🙂 They will generally get 4 yolks and a whole egg, or just yolks. Egg whites in a carton that you can get at your local grocery store you need to be careful with because they aren’t necessarily 100% whites. I have had this problem before. They are colored and flavored and work just fine if you are making an omelet. But if you are going to bake with them, it’s gross because they have garlic and/or onion powder in it 😦 Fresh egg whites are colorless, odorless and virtually tasteless, so you can actually eat them sweet with some berries. I prefer straight up fresh egg whites. 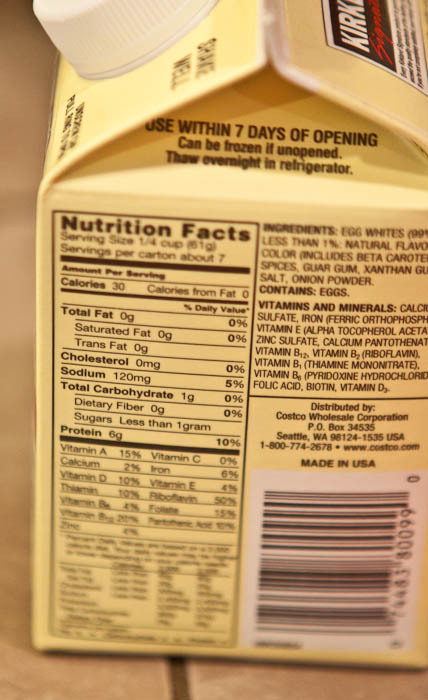 You CAN buy 100% in a carton at the store, just make sure you read the ingredients. Egg Whites International is a great option. It comes in pints, half gallon and whole gallon jugs with a pump that dispenses out egg whites. They keep forever in the fridge. Because I’m a math person by nature, I calculated if this would be more cost effective for me (and not to mention save us some room in the fridge) and it would cost $56 (plus shipping) for two gallons of egg whites (which is about 28 dozen eggs) and it would cost $40.60 for 28 dozen eggs if buying in a 5 dozen flat. Maybe some day I’ll order from them to free up space in the fridge, but right now it’s more cost effective to just buy eggs and put in the time to separate the egg. Interesting about the egg whites international. I always wonder about powdered egg whites. Can you whip those into a meringue? Hmmm..I’m not sure since I’ve never used them before. You could try and if they don’t stiffen up into nice peaks you can add some cream of tartar and see if they stiffen up more 🙂 Do you use powdered egg whites a lot? I’ve never used them. Feel free to enlighten me! I’ve only used powdered eggs once. Yuck. I may just stick with regular store eggs since that is a reliable food item at our little store. We live 200 miles north of the Arctic Circle. So we are always trying to find more efficient ways of getting food up here. Our store is incredibly expensive ($10 for a big bag of chips, $12 for a frozen pizza). If we try the powdered egg whites, I’ll let you know. Oh my goodness!! We were really close to moving to Fairbanks but the company my husband works for sent someone else. Have you looked into Egg Whites International?? Shipping could me more to Alaska but it might not be. I think they could be a good option for you! When we lived in Montreal, it was $7.35 for a gallon of milk, so I know how to that. I was shocked when we moved to the US and milk was $1.99 a gallon! Not to mention none of the additives…. read that label!! I get fresh eggs, luckily!! Right at school. 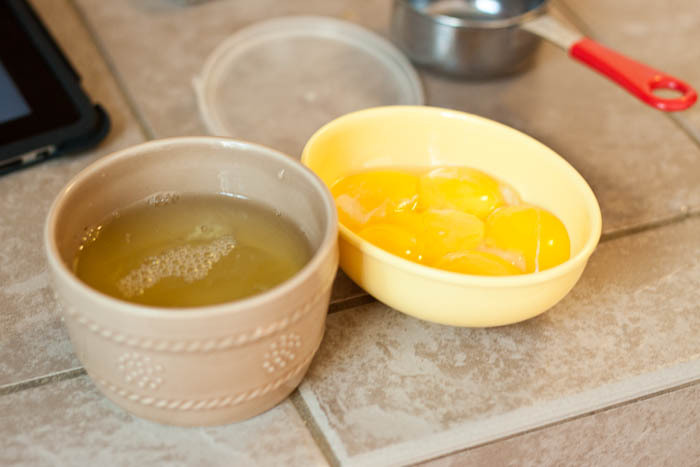 Freeze the yolks and with all that nutriton—eat a few for goodness sakes!